[HollywoodInvestigator.com] "Just do it!" That was the consensus advice given by 2006 Tabloid Witch Award-winning filmmakers to aspirants everywhere. 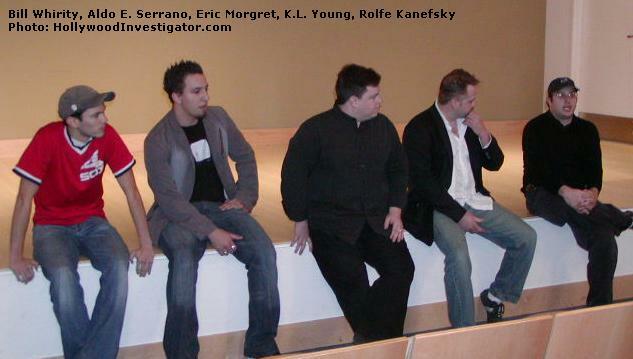 The filmmakers shared their advice after a public screening of their horror films at the Santa Monica Public Library on December 9, 2006. 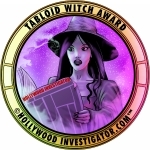 The Tabloid Witch Awards are sponsored by the Hollywood Investigator to discover new horror filmmaking talent. "Writing is key," said Aldo E. Serrano. "A lot of people have ideas, but never write it down. It's about writing and acting." His advice was seconded by Rolfe Kanefsky, who added, "No matter how slick your film looks, it's all about the characters. If you don't care about the people, you don't care about what's going on. So you have to find characters you like, and find actors who can portray that." Serrano added that he tries to avoid visual effects, although it's hard to avoid CGI on an indie budget. Eric Morgret and K.L. Young advise investing much time on the script and on casting. This means many rewrites and many auditions. "Not only writing, but finishing what you start," added Kanefsky. "A lot of people start, have ideas, and never follow through. If you're looking for money, no matter what the budget, investors want to feel that you're responsible and will give them a viable product." Predictably, every panelist declined to identify their investors. Bill Whirity's advice was succinct: "Just shoot it!" Kanefsky concurred: "Doing something rather than studying the theory." After the panel, filmmakers and actors gathered outside the library's screening room to receive their Tabloid Witch Award trophies. 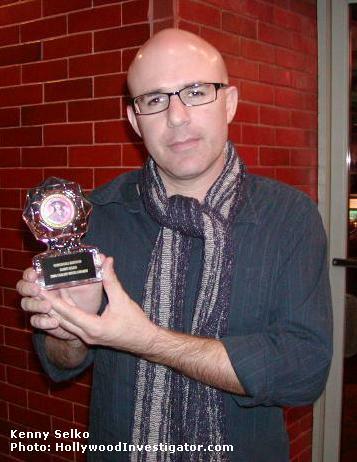 2006's big winner was Nightmare Man, which won a Best Horror Feature Film for Rolfe Kanefsky, Best Actress for Blythe Metz, Best Supporting Actress for Tiffany Shepis, and Best Music Soundtrack for Christopher Farrell. Metz told the Hollywood Investigator she is currently producing a documentary called The Solutions. "It's about how everyone can heal from anything. Cancer, arthritis, hypertension, diabetes, AIDS." The Solutions examines alternative health remedies such as raw living and organic foods, breathing and yoga, and enzyme and oxygen therapies. 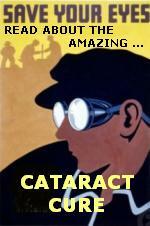 "They found the cure for all cancer, all disease, in 1930, which is oxygen," said Metz. "If you have enough oxygen in your body, no disease can exist. Cancer and disease are big business, and it's sad that the truth isn't being filtrated to the public. People can really heal these things. But there's the disclaimer before everything: check with your doctor before you practice yoga, check with your doctor before you do anything. So we're not being told all the amazing healing remedies that exist for us." Metz also recently submitted an audition reel to Josh Whedon and Joel Silver for the new Wonder Woman project. And she's just finished appearing in The Craving Heart, a drama about soul mates and true love. Tiffany Shepis says she "just wrapped Dark Reel. It's based on a murder that happened in 1958. We're a film crew shooting in L.A., and Scarlett May's ghost returns to mess everything up." The film also stars Lance Henrikson, Ed Furlong and Tony Todd. Shepis also finished Sugar Creek Killer, about a stalker in the woods, and is soon to start shooting a Bonnie & Clyde film. A large contingent of Strange Aeons's Seattle artists flew to Santa Monica for the Tabloid Witch screenings, including director Eric Morgret, writer K.L. Young, producer Marth Christensen, and actors Erick J. Robertson & Jerry Lloyd (who was the Best Supporting Actor Tabloid Witch). Morgret said that he, Young, and Christensen are seeking money for several new horror projects, including Sunset, Fear Itself, and some "Lovecraft-oriented things." Jerry Lloyd recently completed Bullets, Blood and a Fistful of Cash (inspired by Lock, Stock and Two Smoking Barrels). "I play a very bad, bad, bad man," said Lloyd. He's currently filming The Angry Sea, a horror movie about a sea monster, set in the 1780s. "It's a challenge because it's all being done on green screen." 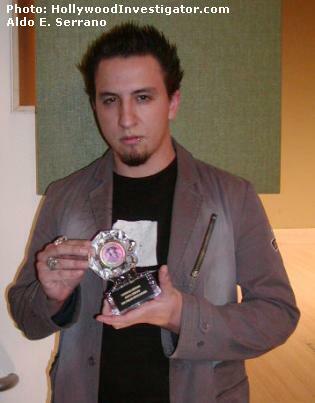 Aldo E. Serrano accepted an Honorable Mention trophy for Moloch, and Juan Rodriquez took home Best Cinematography for the same film. 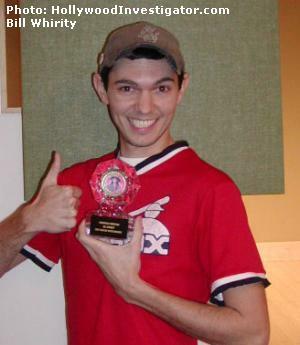 Bill Whirity took home an Honorable Mention for writing and directing Zombie Island. 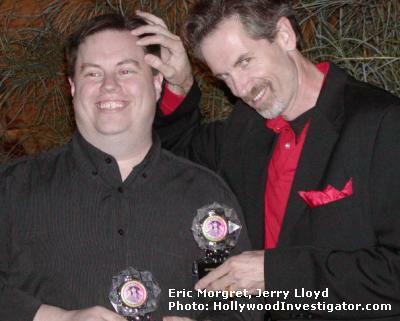 The Hollywood Investigator will continue to follow the the future successes of its Tabloid Witch Award-winning filmmakers and actors! Stay tuned! 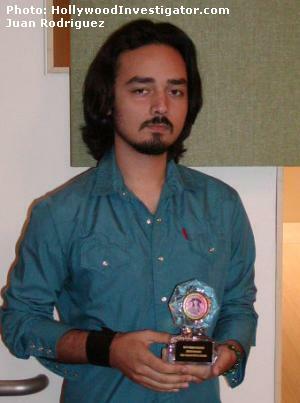 Alone filmmaker Kenny Selko was unable to attend the screenings, but met with the Hollywood Investigator on Tuesday, December 12th, to accept his Honorable Mention trophy. He continues to work on other film projects. If you haven't already read about our 2006 winning films -- read about them now! It's not too early to enter our next search! We're reviewing entries as they arrive. And if you're a filmmaker, actor, musician, or writer who doesn't do horror -- we want to hear from you too! Email or snail mail us about your project, and if we're intrigued we'll cover it or invite you to submit a report!